No, this is not a title for a groundbreaking Supreme Court ruling. It’s a reference to today’s guest guest and the documentary film he’s shooting. Jared is a seasoned filmmaker and cinematographer (and he can really call himself that as he’s worked extensively with actual 35mm films). 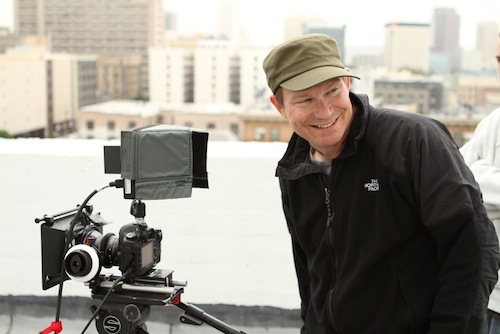 He’s co-founder of Wide Open Camera in Los Angeles, CA and has been a major contributor of knowledge and gear to the burgeoning DSLR filmmaking crowd, reporting for the popular site Cinema5D, and selling various gear though his company. Today we learn about his amazing career. Did you know he started working on Levar Burton’s “Reading Rainbow?” I bet you didn’t. (See what amazing information this show brings you? 🙂 Or that he originally studied forestry. He went on to camera assist for the likes of such documentary filmmakers as Albert Maisel and even Errol Morris. Now Jared is getting into the director’s chair for his own documentary film, “The Board of Education,” a look at capital punishment in the U.S. school system. He is hip deep into his Kickstarter campaign and will talk about crowd-funding as well as filmmaking. This is an episode chock full of great info! Next week on the show we have commercial video producer and video business coach Kris Simmons of My Your Video Business. If you’re trying to make money at this thing, tune in.